Join us for an intercultural feast to celebrate our appreciation for the harvest, community connections, and the Coast Salish land we call home at the innaugural Britannia Sukkot Festival. Sukkot is the Jewish harvest festival, held each autumn to celebrate the bounty of nature and the giving of the Torah by God to the Jewish people. To commemorate this holiday, Jewish families build temporary outdoor shelters (Sukkahs), where they dine with family and friends each evening for a week. These temporary shelters remind us of the impermanence of our possessions and harken back to the 40 years the Jewish people wandered through the desert following their emancipation from slavery in Egypt. Sukkot expresses universal themes of harvest celebration, cultural identity, human vulnerability, and community. 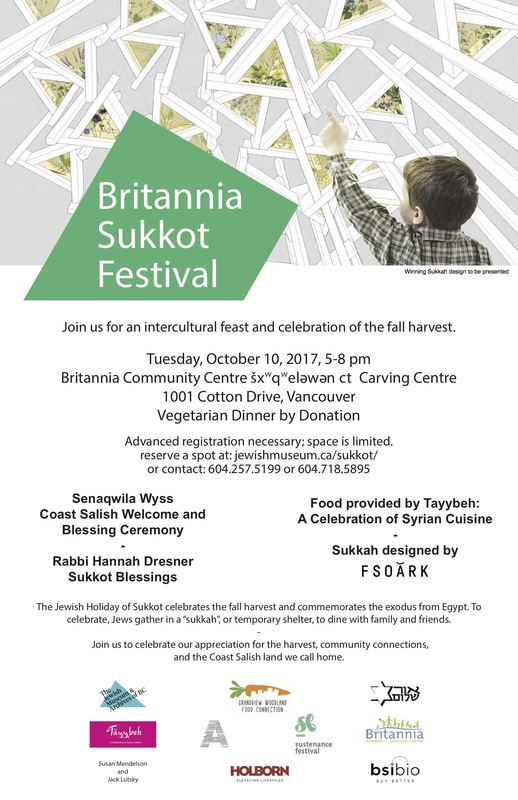 The Britannia Sukkot Festival will bring together diverse community members to feast and share in both a Jewish Sukkot and Coast Salish led ceremonies as part of the city wide Sustenance Festival 2017. Advanced registration necessary; space is limited. Eyepiece by FSOARK, the winner of the 2017 JMABC / GWFC Sukkah Design Competition. Presented by the Jewish Museum and Archives of BC, Grandview Woodland Food Connection, Britannia Community Centre, and Or Shalom.